Each year in September around the 20th at Samukawa jinja Miyayama, Samukawamachi, Koza County, Kanagawa Prefecture, the Takeda ryu holds it's annual yabusame (流鏑馬) ceremony. Takeda ryu dates back to the 8th century and practises the same methods and rituals as established in the 12th century by Minamoto no Yoritomo, the first Shogun. There is parking around the Shrine. Takeda ryu yabusame at Samukawa jinja. Each year in September around the 20th at Samukawa jinja Miyayama, Samukawamachi, Koza County, Kanagawa Prefecture, the Takeda ryu holds it's annual yabusame ceremony. Takeda ryu dates back to the 8th century and practises the same methods and rituals as established in the 12th century by Minamoto no Yoritomo, the first Shogun. The yabusame ritual is quite exhilarating to watch. It is definitely action packed and the audience gets involved right from the start cheering on the archers and applauding when their shots are successful. The event starts with a dedication to the kami and a ritual purification of the course, then follows a procession of all the archers, the overseers, and all the attendants. A test run of the course may take place and then the actual shooting begins with up to ten archers shooting at three targets spaced at 65 metres apart. The course is 218 metres long. Each archer gallops along the course and fires his arrows at the three targets, this takes about 15 seconds each time when the horses are galloping at full speed. At first, larger targets made of paper are fired at, and then smaller clay targets are introduced at the last part of the ritual which is called kyosha. This part of the ritual is actually a competition between the archers and it is at this stage that it gets very exciting. The audience soon starts cheering on their favourite archers. The smaller targets in the kyosha competition are round and 17 centimetres across. They are called san-sun no komato. They consist of two clay bowls which are glued together. There is colourful confetti inside the clay targets, and when the target is hit, the clay breaks and the confetti sprays out giving an explosive effect. The best archer is decided based on his performance. At the close of the ritual, the archers and the attendants are served Omiki (sacred Japanese liquor). 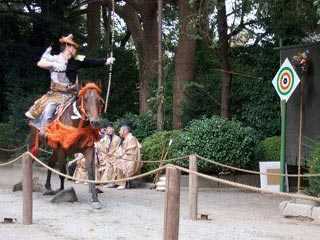 This ritual is a must see for anyone interested in Japanese martial arts, and mounted archery in particular. Yabusame, a tradition stretching back over 1,000 years, is a ceremony held to rid the area (surrounding villages and farms) of evil "spirits." The 29th emperor of Japan, Kinmei, first performed this ceremony in about 530 C.E. when he fired arrows from horseback at three targets which represented the Sankan (the three Korean countries of the time). Archery and its accessories - bows, arrows, and quivers - have for centuries been firmly associated with Amaterasu-ohmikami, the most important Shinto deity of Japan, and also said to be directly linked in lineage to the Imperial Household of Japan and the Emperor, who are considered descendants of the kami themselves. As such, the bow and arrow is the symbol of the imperial household and the sacred symbols of the descendants of the sun goddess Amaterasu-ohmikami. In the ancient text the Nihon shoki it states that, "Amaterasu-ohmikami slung a thousand-arrow quiver and a five-hundred arrow quiver over her back and brandished her bow upwards." It is said in Japan that the bow is not so much a weapon as an instrument of magical sound which reaches into the world of spirits. The strumming sound of the bow in conjunction with specially designed "singing" arrows are used to call the kami. The bow is considered a torimono - a type of spiritual conductor - which can call upon the kami. It is even recorded that Minamoto no Yoshiie cured emperor Horikawa with "three demon-chasing twangs of his bow." When the arrow is shot, it announces to the kami that a rite is about to take place and that their presence is required. At Shinto shrines across Japan one can see hamayumi (evil-dispelling bows) and hamaya (evil-dispelling arrows) which are potent symbols of sacred power for many people today. Video report by Junpei Hayakawa.